A 21-year-old male presented with a six-month history of bilateral progressive hand and forearm muscle weakness and atrophy. He had no sensory symptoms. Power in both hands and forearms was 3/5 and 4/5, respectively. Weakness and wasting on both sides were nearly symmetrical, and his tendon reflexes were normal. There were no fasciculations/polyminimyoclonus or autonomic disturbances. He had no past medical history, allergy history, or relevant family history. Clinical exam revealed normal blood pressure (120/80 mmHg) and pulse rate (80 beats/minute). Routine blood workup (hemogram, blood sugar, and renal function tests) were normal. Plain cervical spine radiographs were within normal limits. Figure 1 shows the magnetic resonance images (MRI) of the cervical spine. Figure 1: (a, b) Magnetic resonance imaging (MRI) examination in neutral position showed focal reduction in spinal cord caliber at C6-C7 level. (c) T2-weighted MRI images in flexion position showed anterior displacement of the posterior dura by a crescentic extradural intermediate signal intensity, representing a congested epidural venous plexus. The patient’s MRI examination in neutral position revealed a focal reduction in spinal cord caliber at C6-C7 level [Figure 1a and b]. T2-weighted MRI images in flexion position showed anterior displacement of the posterior dura by a crescentic extradural intermediate signal intensity, which represents a congested venous plexus [Figure 1c]. Hirayama disease, a type of benign cervical myelopathy associated with neck flexion, affects young males and becomes stationary after a progressive course.1 It is insidious in onset with unilateral upper limb weakness and atrophy. Classically, there is no lower limb involvement, sensory disturbance, or tendon reflex abnormalities. Symptoms concerning the pyramidal, spinothalamic, posterior column tracts, or any polyminimyoclonus or autonomic disturbances in Hirayama disease are rare. This disease may be wrongly diagnosed as an atypical presentation of amyotrophic lateral sclerosis, which is a type of motor neuron disease.2 Hirayama first described this disease in 1959 and most cases have been reported from Japan and India.3 Hirayama disease has an initial progressive course with the spontaneous arrest of disease progression several years after onset differentiating it from motor neuron disease, which has a progressive, fatal course. Amyotrophic lateral sclerosis, caused by degeneration and death of motor neurons, presents with fasciculation, muscle weakness, stiffness, and muscle atrophy. All voluntary muscles are gradually affected in amyotrophic lateral sclerosis with most dying due to respiratory failure. Other clinical differential diagnoses include the distal form of spinal muscular atrophy, post-polio syndrome, multifocal motor neuropathy with conduction block, toxic neuropathy, and structural lesions of the cervical cord (like syringomyelia or tumors).4 However, none of these diagnoses demonstrate the characteristic imaging findings described in Hirayama disease. In Hirayama disease, chronic ischemic changes involving the anterior horns of the cord from C5-T1 level occur due to repeated cord flexion within a tight dural sac.3 Disproportionate growth of the vertebral column in comparison with the spinal cord is also an etiological factor. 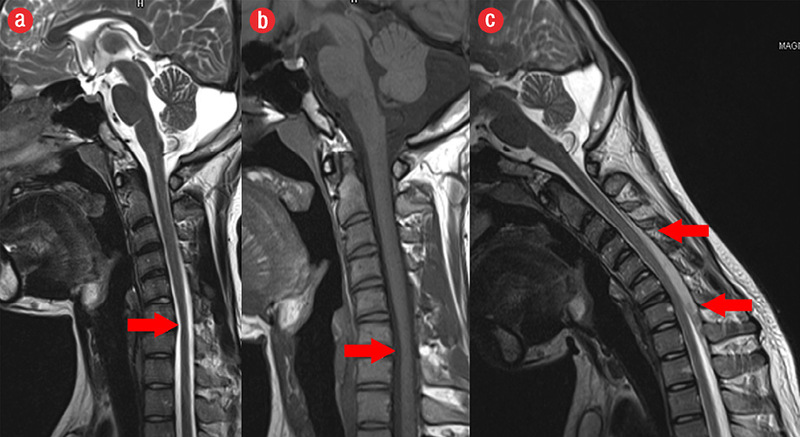 Raised serum immunoglobulin E levels and several allergic disorders have been described in association with Hirayama disease.3 Repeated tightening of the spinal dural canal during neck flexion leads to an anterior shift of the posterior dura, causing spinal cord compression against the vertebral body, multiple episodes of cord ischemia, and chronic trauma. This leads to asymmetric lower cervical cord thinning and myelopathy, as seen on MRI. Segmental, inferior cervical spinal cord atrophy on neutral neck position MRI has a reported sensitivity of 59% and a specificity of 100% for Hirayama disease.5 Flexion neck MRI with thin section heavily T2-weighted sequences exquisitely demonstrates Hirayama disease. This patient was treated with a cervical collar, which arrests disease progression by preventing neck flexion. 1. Chen CJ, Chen CM, Wu CL, Ro LS, Chen ST, Lee TH. Hirayama disease: MR diagnosis. AJNR Am J Neuroradiol 1998 Feb;19(2):365-368. 2. Hirayama K. Juvenile muscular atrophy of distal upper extremity (Hirayama disease): focal cervical ischemic poliomyelopathy. Neuropathology 2000 Sep;20(Suppl):S91-S94. 3. Tayade AT, Kale SK, Pandey A, Kalantri S. Hirayama disease. J Neurosci Rural Pract 2010 Jan;1(1):46-48. 4. Anuradha S, Fanai V. Hirayama Disease: A rare disease with unusual features. Case reports in Neurological Medicine. 2016 Dec [cited 2017 Aug 27] Article ID 5839761: [about 4p.]. Available from: https://www.hindawi.com/journals/crinm/2016/5839761/. 5. Chen CJ, Hsu HL, Tseng YC, Lyu RK, Chen CM, Huang YC, et al. Hirayama flexion myelopathy: neutral-position MR imaging findings–importance of loss of attachment. Radiology 2004 Apr;231(1):39-44.